Personalised Kids Apron with a name embroidered to make a special gift. Hot Pink apron made from 65% cotton and 35% polyester and is fully machine washable with similar colours. 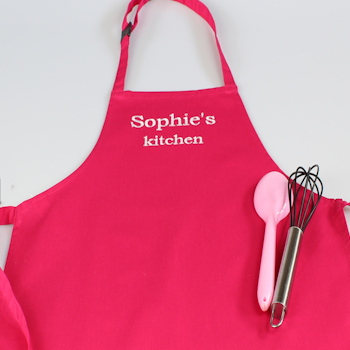 Hot Pink apron made from 65% cotton and 35% polyester and is fully machine washable with similar colours. Pullover loop neck strap and adjustable waist ties This apron is available in two sizes: Small 43cm wide by 53cm length (fits approx 3-6 years). Medium 48cm wide by 63cm length (fits approx 7-10 years). Great for kids to learn to cook, clean and make lots of arts and crafts in! Suitable material perfect for fabric painting onto as well! Personalised with beautiful embroidery in your choice of thread colour and letter font style. Have a name, nickname, initials or brief message embroidered on the top of this apron.